This cohort of u20s finished 2-1-2 in the u20 Championship. The forwards occasionally struggled to establish dominance but a number of the backs caught the eye. Following from last year’s group, we thought we’d do a 4 Up 2013, concentrating on a player from each of the provinces. Olding travelled to the JWC12 and started at second centre for the last two games, victories over England and France. He was involved with Ulster upon his return, landing a conversion against Munster down in Thomond in December 2012. Olding got his first full start against the Ospreys at out half in a 12-16 loss and started five league games straight as injuries to Luke Marshall and Paddy Wallace opened the door to the twelve jersey. Olding came on against Saracens in the dying minutes of the Heineken Cup quarter final and looked classy. Olding made two appearances for the u20s in the 2013 Championship, both at full back in matches against Wales (15-17) and France (22-5). Olding’s versatility is striking and suggests real football ability which is reinforced when watching him. He looks capable of stepping straight into Paddy Wallace’s shoes at first centre and creating real competition for both Paddy Jackson and Luke Marshall. 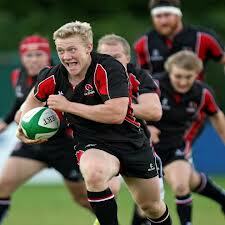 BRA alumni Olding is playing his club rugby with Belfast Harlequins and is in the Ulster Academy. The 88kg 1.78m Olding follows in the footsteps of recent URSC Jack Kyle bursary winners Craig Gilroy and Iain Henderson and looks set for a successful professional career with representative honours at the highest level. Rory follows in brother Niall’s footsteps as an underage international and started all five games in the championship, four at first centre and one at out half. He coolly nailed the conversion of Ireland’s final try against Italy to grab a draw and displayed good habits throughout the competition. Scannell is playing for Dolphin in Division 1A of the AIL and upon his return from the underage championship has bedded down at second centre with Danny Barnes occasionally moving to the wing to accommodate Scannell and Munster academy player Cian Bohane. Danny Barnes and Scott Deasy are barring his way at A level in the B&I Cup. Barnes is one of the names that crops up when reviewing Scannell’s season. Barnes started 9 of Munster’s first 12 games in 2011-12 scoring four tries and also started in the Magners League final in May 2011. Will Chambers and Keith Earls then got more of a look in at second centre before Casey Laulala’s signing closed the door on Barnes who has started one game under Rob Penney and that on the wing. When comparing Barnes, who is only 23, and Scannell you get an impression of there being a relatively small window of opportunity for professional players to bed down a place in a squad. As things stand Scannell is on a sub-Academy contract but not yet an Academy one like big brother Niall. Henshaw is still listed as a first year Academy member at Connacht but has nailed down a first choice spot at Connacht and signed a deal until 2015 that makes him full time. Before joining Connacht Henshaw captained Marist College to a Connacht Schools’ Cup win as well as playing minor football for Westmeath. Having come off the bench in the first few games of the league, Henshaw made his starting debut against Glasgow in the centre during September. He has since started 18 matches at full back in both the Rabo Pro 12 and the Heineken Cup. Henshaw also played full back for the u20s in the Championship win against England. Henshaw’s name cropped up in the 2012 5 Up series when discussing Shane Layden. Both Buccs men, the big contrast between the two is injuries and Henshaw has proved durable enough to play a lot of senior rugby at a young age thus getting valuable experience and name recognition, which never hurts. Henshaw scored his first try at senior level against Edinburgh and will have a new head coach next season when Pat Lam takes over at Connacht. There will also be a new Ireland coach and it will be interesting if Connacht’s players get more chances in the new regime than when Declan Kidney was in charge. We had a look at Daly before and I was very tempted to follow the progress of Steve Crosbie, the Old Belvedere fly half who looks a very tidy footballer. Drico’s retirement weighed the scales in Daly’s favour. Although the General has yet to make a formal decision the day is not long away and if it is not at the end of this season then it will surely be at the end of the next (please let it be next year!). That will leave a gaping hole in Leinster’s midfield and someone will have to fill the 13 shirt. While Eoin O’Malley is the heir apparent he has struggled with injury and Daly is a contender. At 192cm and 102kg, he is a different build to either O’Malley or O’Driscoll. Daly started all of Ireland’s games in the u20 Championship and also handled the place kicking duties, nailing seven kicks against France. Daly, who turns 20 in July 2013, is not in the Leinster Academy but made four starts for Lansdowne on their way to a first AIL title. Representative call ups after Christmas prevented him from adding to that total. He also appeared off the bench in the B&I Cup. Although the AIL has lost a lot of its lustre, it remains a prized league for those involved and provides exposure to senior level competition along with development opportunities for young players. The B&I Cup is also developing into a proper competition that offers a taste of professional rugby. The English teams that compete are from the Championship and many of the line ups feature familiar names with Rabo Pro 12 experience. Like Henshaw, Daly has an inter-county GAA background and it is interesting to note the number of quality athletes competing in both codes at a young age. Rugby provides the opportunity to make a living as a professional athlete while the legacy created by the likes of Keith Wood and Brian O’Driscoll along with success in the Heineken Cup has increased rugby’s visibility massively. The sport’s ability to attract top quality athletes from outside its traditional catchment area is an encouraging sign for the development of the game in Ireland. This entry was posted in 5 Up and tagged Robbie Henshaw, Rory Scannell, Stuart Olding, Tom Daly by dementedmole. Bookmark the permalink. There is a large injury list still so it will be interesting to see who emerges after the U20 world cup.Leavy was one schoolboy who really impressed over 3 campaigns for Michaels who i would like to see more of.Farrel looked good for castleknock in 2 cup games last year and was an ever present during the inter pro’s.Daly played more 12 and only switched to 13 with his injury.Likewise i would like to see if the Byrne front rows from Clongowes can make an impact. Amazing how injury can be so pivotal(as outlined in your last 5 up review)all of these impressed massively in school but have failed to make an impact due to injury and will have to wait and see does the window of opportunity to showcase their talents close. Excellent work Mole, just a random query; how come Marist college don’t compete in the Leinster SC? This brings me back to crazy thought I had. Maybe the IRFU should steal an idea from the NFL in the states and that is the draft. Obviously it would not be collegiate based but I was thinking schools based and a separate draft for u20 clubs. So what I was thinking is that the Irish team who has the worst performance in the Rabo the year before gets the 1st draft picks. So basically we could imagine that connacht could get the best 25% of young players coming out of school and and clubs regardless of where the players are based. thats just an example it would divvy up the talent evenly and develop better players faster. also the weaker-intermediate players going to leinster/munster/ulster would benefit form playing and training alongside players who have a lot of international experience etc. agree there could be something done to encourage players to try a different province but there are two big flaws. Other problem is the work done by the provinces before 20’s/academy level. There is screening done at JCT level,players monitored even physio organised and paid for. The provincial loyalty starts with U17’s,U18’s U19’s.. Hard to switch allegiance after that and would the provinces keep investing in young lads if they risk losing them at 20’s level just when the work is starting to pay off. I love the draft and think it is one of the most endearing things about NFL but the draft is made of college players, who have already been headhunted from their schools for college. Like Yossarian, I think the fact it happens at a different stage of the career is very important. College football is a highly competitive and professionally run game (unlike schools rugby). Would be good to riff on the idea though: national academy only until college grad age? Alternatively rugby in Ireland is small enough that the heads of the 4 provincial academies could meet. Leinster could outline who they intend to keep and even give recommendations of players who they highly regard but just don’t have space for.The provinces could look at these guys themselves during the 20’s/club and interpro and make up their own minds without risk of treading on the toes of each other. In order to optimise resources, I think there’s always going to be a balance to be struck between a “republican” and a “federal” system. The centralisation of resources is subject to political interference whereas the federal system sees a disproportionate amount of resources concentrated in certain provinces. I think the provincial academy model is the best way ahead but that the transfer market in Irish rugby is in its infancy and we will see more players trade provincial allegiances in order to get game time as a starter. How contracts are structured and whether transfer fees will be introduced are two of the side effects of this happening. The draft works because all 32 teams play by the same rules. Players can lump it or leave it. Most of them are glad enough to get a job that they’ll move anywhere. The IRFU have worked for years to make players want to stay locally. The draft system falls apart quickly here. Best bets for the IRFU would be to support more or less the existing structures or to develop a national academy with regional branches. This would involve expanding the support structures around the U20s and national underage coaches and moving the existing resources under their remit. But that doesnt fix anything that couldn’t (wouldn’t even) be solved as things are. Resource allocation might be a little more efficient (or less) but players who don’t make the grade in one place would have all their doors closed. Good post that. Can’t wait to see Adam Byrne in the U20 world cup, he could get a bit more senior gametime with Leinster next year. One guy I liked the look of that I wouldn’t have picked out previously was Crosbie. Great step, and his playmaking reminds me of the way Sexton plays. Not a 10 for me though, would love to see him get a go at 12. When will the academy spots come out? Nice work. So many young taleneted 10/12s in the past two twenties squad would it be beneficial for the Irish team if Oldings future was at 13? Just had a look back over Oldings cameo against Saracens, the lads feet are absolute magic, left a few would be tacklers looking very silly, in the last 2 mins he bet 5 defenders in 3 seperate carries, made one offload out the back door and threw a lovely improvised pass to Henderson for his try, where does his future lie though, I’d love to see him tried at 13 myself. Daly is another place kicking 13, who’s not really an outside center. There are big shoes to fill, but wishful thinking shouldn’t replace reality. We’ll know more as he develops and makes a step up. Positional switches are still very common at his stage. It’s interesting that there are two standout candidates at this stage. Olding and Henshaw are streets ahead in terms of senior experience and both look dead certs to make the grade as pro players. This is in stark contrast to the other two mentioned who aren’t even full academy players yet. I’d have put the U20’s captain Luke McGrath on the list. I also think that there’s more to be seen from the forwards, badly timed injuries were a big factor though. Was seriously impressed by Dooley, grew as the tournament progressed and still eligible next year. Carries quite like Kilcoyne and was strong in the scrums too. Good work senor Mole. Point on Henshaw – saw the rumour on a few places that if he’d kept himself uninjured, he’d have picked up a cap in the Six Nations. Daly ended up getting a Leinster academy place for next year. Really think he is playing out of position for the under 20’s at 13 and is more suited to 12. DM – McGrath and Daly were excellent today for the U20s in their defeat of the shackle-draggers. Any chance of a review of the U-20’s matches so far DM?